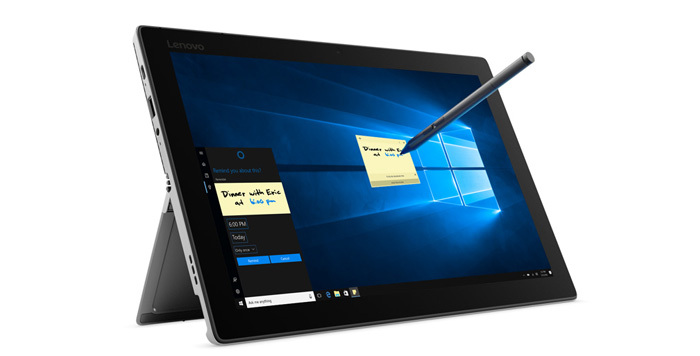 Tablets & 2-in-1 Tablets Lenovo Miix 520 2-in-1 Tablet Review: Can it Beat the Surface Pro? Lenovo Miix 520 2-in-1 Tablet Review: Can it Beat the Surface Pro? When it comes to Windows-based tablets, Microsoft’s own Surface Pro line understandably leads the pack. But that doesn’t stop other manufacturers from trying. 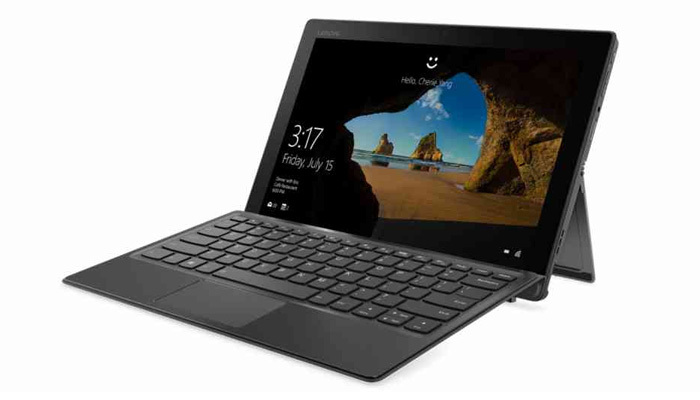 Technology company Lenovo (known for their smartphones, personal computers, laptops, electronic storage devices, and servers) actually has its own line of 2-in-1 Windows tablets called the Lenovo Miix that they are playing up to become viable Surface Pro alternatives. While some of the older models in the Miix line are okay-ish at best, they just can’t seem to offer anything that would make consumers choose them over other similar products on the market. For example, the Miix 510 was a decent enough tablet, but it was severely lacking when it came to the camera resolution and processing power department. However, Lenovo is aspiring to change all of that with the Miix 520. While retaining most of the good parts of the 510, it comes with a better processor, integrated graphics, and camera than its predecessor. Let’s take a look and see if the Lenovo Miix 520 with all of its updated trappings finally has a fighting chance against the Surface Pro. 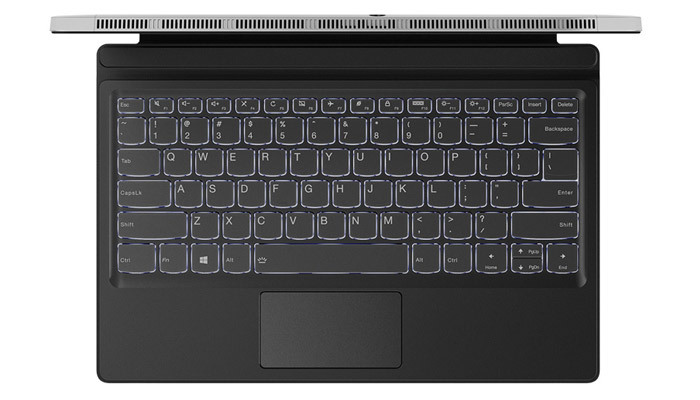 The Miix 510 processor (Core i5-6200U C) was capable at most tasks, yet stutters at jobs that require multi-tasking. However, having the latest 8th generation Intel processor did a lot of wonders for the Miix 520. For one, you can now multitask without lagging or performance drops. The processor is also supported with a very generous 8GB of RAM, which means that resource hogs like Google Chrome (which is an application known for using freaking amounts of RAM) can run smoothly. As for the onboard integrated graphics, the Intel HD 630 GPU does it job well enough. It’s actually quite powerful on its own, packing enough juice for basic photo editing (e.g Adobe Photoshop) and even gaming. While you can’t run the latest games on it, it’s powerful enough to take on older games (e.g. Portal 2, Left 4 Dead 2, Bioshock) and most indie games like Terraria, Fez, and Shovel Knight just fine. The display isn’t something to write home about. At 12.2 inches, the Miix 520’s display is more than a full inch smaller than its nearest competitors, whose displays can reach up to 13.3 inches. The resolution is at 1920 x 1200 and is in full HD. While it definitely looks nice and the colours really pop out from the display, it pales in comparison to tablets that have screens at 2K resolution or those that have UHD displays. So expect to see a few pixels here and there when you’re using the Miix 520. To be fair, you probably won’t be using the device for something that requires you to display graphics and video at the highest resolutions, so for most users, the Miix 520’s display is more than enough. The viewing angles are pretty good, so you can easily watch YouTube or Netflix HD videos on the tablet comfortably. As for the design, we’ll have to give plus points to Lenovo for going for a look that’s uniquely theirs, and is not a direct copy of other popular tablets like the Apple iPad or the Microsoft Surface Pro. Too many Chinese manufacturers often go with aesthetics reminiscent of these popular brands, and thus we have a market full of tablets that all look the same. The Lenovo Miix 520 looks pretty much like its older brother, the Miix 510. You have that Lenovo logo prominently displayed in the top left corner of the device, and the front camera directly in the top and center of the screen. The microphone is also conveniently located on the left, useful if you’re going to use the Miix 520 for Skype, Google Hangouts, or Facebook Messenger’s video call. The hinge of the Lenovo Miix 520 deserves a lot of praise. It’s a watchband hinge made out of 280 pieces of stainless steel, which provides extra strength and durability to the device. While it can be folded up to 150 degrees only (compared to the 170 degrees of the older Miix 510) this angle is actually more comfortable to use. Most people don’t have their laptops stretched out that far back when they’re using it. 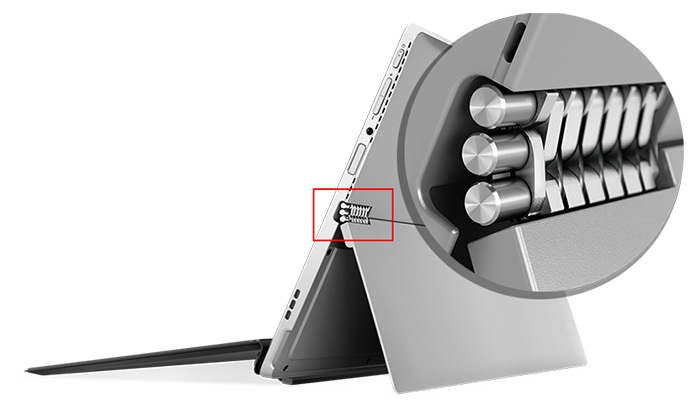 Air vents are located on the top of the Miix 520. 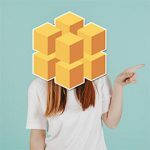 They don’t cause that much trouble most of the time, but if you’re doing tasks that put a lot of strain on the processor, the fans might work overtime and blow hot air in front of you. Connectivity-wise, the Miix 520 is in good shape. It has a USB Type -C port that you can use for data transfer, a micro SIM slot, and a USB 3.0 port. Lenovo also seems to very proud of their second generation Active Pen that comes with the Miix 520. And rightly so, this stylus is unlike any other stylus that is out on the market today. It actually feels like as if you’re using a real life pen and you’re writing on real life paper. It’s that realistic. This is perfect if you like to use the Miix 520’s display as a graphic tablet for illustrations and the like. It’s also great for writing on your notes. If you aren’t that fussy about the display and sound quality and you just want a device that can run Windows 10 on the go, then you might want to give the Lenovo Miix 520 a try. The Active Pen 2 is the highlight for this machine. It’s like carrying a real notebook with you- only digital. The Lenovo Miix 520 might not be the Surface Pro, but it can do most basic tasks that casual users usually run, really well. This machine is well-suited for students and illustrators for that reason.